Driving is a skill that will last for a lifetime, thus requires a good level of proficiency. Go And Drive Driving School is all about making it easier for our students to build their knowledge and get behind the wheel safely. That’s why we provide a range of unique and convenient features that Arizonans will enjoy. Go and Drive Driving School provides our instruction in a safe, positive and friendly environment, with classroom facilities dedicated to modern learning and instruction. If you have any questions about our process or available features, simply contact us at (480) 802-0000 and we will help to answer any questions you may have. Your driving future shouldn’t depend on whether you can get a ride from someone. All of our behind-the-wheel training packages come with complementary pickups and drop-offs. Our trainer will show up at your doorstep to pick you up for the training session. Once the session is completed, the trainer will drop you off at your home. Optional shuttle services are available for all our in-class training. Browse our services and select the desired package to get started. You will be excited to see our variety of classes, training, and packages to select from. Please feel free to call us at (480) 802-0000 if you have any questions on the pickup/dropoff/shuttle features. Driving classes and tests should be accessible to everyone, but life isn’t that simple. At Go And Drive, we’re balancing the scales by making driver’s education affordable. We offer flexible payment plans for those who qualify for our financing program. Visit our Driving School Financing section to learn more. We offer a budget-friendly financing plan with 0% interest. Enjoy everyday financing for up to 12 months or limited-time promotional financing offers. We’re not trying to profit from your debt. We simply want to see you succeed, so we’re willing to help in any way we can. Our budget-smart financing lets you pay for your Driving Classes over time. Once approved, with an initial deposit of $200 you could signup for the classes. Go and Drive Payment Plan requires the balance to be paid off in full before the last training session or the road test can be provided. 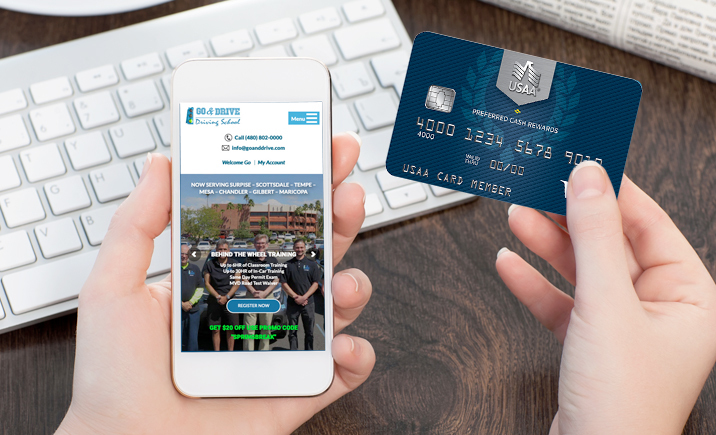 Please feel free to call us at (480) 802-0000 if you have any questions about our Financing Program. Granting a loved one the freedom to stretch their wings and drive for the first time can be tough. We’ve made it easier for parents and guardians. Our office has the ability to track all student drivers in real-time via inbuilt GPS. Our Vehicle Tracking Solution is a unique comprehensive system for managing the daily driving sessions that links the driving school, instructors and students into one powerful system. The solution provides detailed feedback on student’s driving which including GPS tracking, engine diagnostics, and driver behavior, etc. resulting in the most integrated Driver’s Behavior Monitoring system on the market. Our system features real-time ETA alerts, speeding/direction alerts, location alerts, boundary alerts, fuel alerts, engine diagnostics including battery level, RPM and odometer via SMS. On top of watching where your son or daughter is traveling, the system actively analyzes driver behavior and detects driver violations such as sudden braking, excessive speeding, rapid acceleration, lane crossing, and sharp turns. This valuable information helps ensure students are driving and practicing the best approach, creating a safer, more reliable environment for them and other drivers. In other words, you never have to entrust your child to strangers without taking complete safety precautions. Please feel free to call us at (480) 802-0000 if you have any questions about our Student Monitoring feature. One of the best ways to keep Arizona’s student drivers safe is to ensure that we set flawless examples – so we train our instructors thoroughly. Getting in a car with a Go And Drive instructor exposes you to a wealth of technical facts and practical skills. Browse our Driving School Packages if you ready to enhance your overall driving knowledge? We also don’t believe in half-measures. In addition to doing everything in our power to maintain a safe vehicle, we add extra protection equipment, decals, mirrors and other features that keep your student driver out of harm’s way. Need a female trainer? We have a diverse staff ready to help. Go and Drive driving instructors are able to sense when a student needs help, is nervous, is confused, is stressed, or is distracted and can provide whatever is necessary to improve the situation. Our trainers will not drag the training on and make the students take more lessons if the are not needed. They set a pace that is perfect for each student. Feel like getting your classes done on a Saturday or Sunday? With Go And Drive, you don’t have to shift your entire schedule to make room for your learner’s permit training or driver’s license test. Please feel free to call us at (480) 802-0000 if you have any questions about our Class Schedules or Appointments. Learning to drive is more fun when you feel safe at every turn. Working with our instructors and gaining new tools for handling hazards helps you become confident and better at responding to risks — Why not build a firm foundation for all of your future driving experiences? Talk to a Go And Drive trainer to discover how you can achieve real learning progress. Our instructors are responsive to the students and are ready to discuss subject the students want to discuss and answer the questions the students present. Please feel free to call us at (480) 802-0000 or browse our Driving Class Packages to register online.